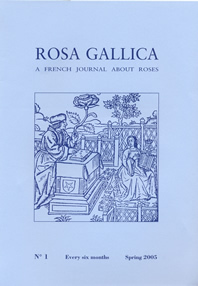 There were approximately 150 foreign members of L'Association ROSA GALLICA at the end of 2004. That is a significant number, considering our newsletter is mainly devoted to roses of French origin, is written in French, and has not been given any foreign publicity. We have now decided to publish an English newsletter to broaden our audience, and welcome you to join. Our English edition has made its debut in spring 2005. First we will publish two issues per year, one in the spring, the other in the fall. These semiannual issues will present an assortment of articles that appeared in previous newsletters in the French language. Their selection will be based on delivering the latest information of the historic French varieties, which are the specialized interest of our association. If it proves that the English issue sufficiently interests rose lovers, the frequency of publication could increase to three or four issues per year. If you would like to refer to the index of the issues, click here. For 2005 and 2006, the subscription price is set at 10 euros per year. If you are interested in subscribing, click here.